If you have ever wondered what it might be like to live in an online game, Sword Art Online brings to life a world where this is possible. This anime series visits this concept with an intriguing story line and is based on the light novel series by Reki Kawahara, The first episode was aired on July 7th 2012 and is currently showing on Crunchyroll. The story takes place in 2022 and begins with players logging into play an online gaming system that is still in beta. 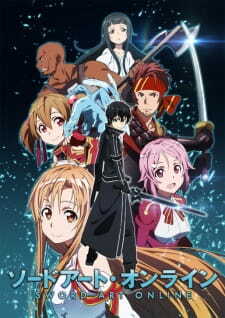 When the game finally goes live, the players find out that the creator of SAO has designed the game so that if any player's avatar dies while playing the game, the player will die in the real world and any player that attempts to log off and remove the visor and helmet they are wearing to play this game, will also die. The story seems to be fairly straight forward when it starts but as it continues, the plot twists and turns quite nicely. Characters can be killed off during the game play and even important characters can die unexpectedly. The personalities are developed in interesting directions that keep viewers watching. The artwork is beautiful and works well with the animation to make a very beautiful world come to life. In the unreal worlds of Sword Art Online, very real questions about life become the focus. As the main characters, Kirito and Asuna develop through the story, they explore life and what is truly important. They face some surprising challenges as they discover who the creator of SAO is and as the show progresses, new surprises are around every corner. There are 24 episodes and they are scheduled to run through the end of the year. Be sure you don't miss this one on Crunchyroll.